Serving toddlers all the time, I'm looking for kid-friendly items that I can freeze because I have more time to cook on the weekends rather in the middle of a busy week. I make these to have on-hand. One of the parents of a toddler I care for came in the door as I was pulling a batch of these out of the oven. I offered her one. She LOVES them. When she recently had surgery, I knew exactly what I was going to send to her for her recovery when she got home. This is the batch I made for her. She was very happy! These would be great to stock up in the freezer for on-the-go meals or quick, reheat meals--just add some carrot sticks. Preheat oven to 425 degrees. In a skillet, cook beef and onion over medium heat until meat is no longer pink; drain. (I used leftover ground beef that I had in my freezer). 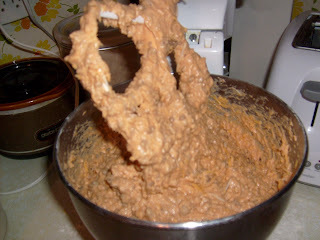 In a mixing bowl, combine flour, sugar, baking powder and salt. In another bowl combine ketchup, milk, butter, eggs and mustard. Stir into the dry ingredients just until moistened. Fold in the beef mixture and shredded cheese. 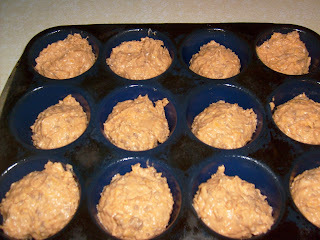 Fill greased miniature muffin cups three-fourths full. Bake for 15-18 minutes or until a toothpick inserted in the center of a muffin comes out clean. Cool for 5 minutes before removing from pan to wire rack. Refrigerate or freeze leftovers. 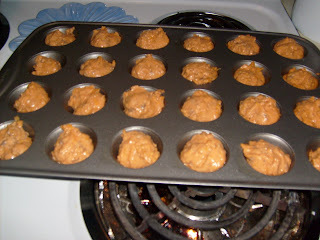 I made a big double batch and used both my mini muffin tin and my regular muffin tin, adding a few minutes for the larger ones (I put a toothpick in the middle to test to see when it was done.) I put most in Ziploc gallon baggie to send to my friend. The leftovers, I put in quart-sized baggies in toddler meal-sized portions and put in my freezer, oh, except for the ones we had for lunch. Freezer Food Friday at What A Crock! Hmmm, these seem interesting. A cheeseburger that's also a muffin? I'll have to try these. Do you eat them warm or cold? YUMMY and fun too. I can't wait to try these out on the family. Thanks for sharing with OuR KrAzY KitCheN. I haven't thought about eating them cold? Maybe I'll give it a try. I heat them and they smell and taste soooooo good! Hi Pamm, I am very interested in this recipie. What do you eat them with. You mention just carrot sticks. No pasta or so?? When you reheat them how do you do that and how long? Thanks for sharing. I am going to try these. Pamm, do you combine both bowls and meat mix then bake, I seem to be missing that part on my screen, sorry. I cant wait to try these. 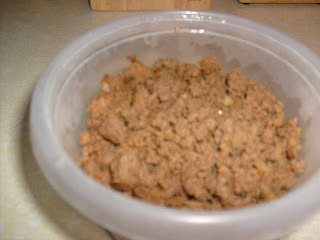 Tami--Yes, you fold the meat into the other bowl, stir until just mixed. Poppedijne--I don't serve with pasta as these muffins count as the bread component and the protein component of the meal. I serve a fruit and a veggie with these. What a great idea. These look and sound delicious. Thanks for sharing them with us. Have a wonderful day.